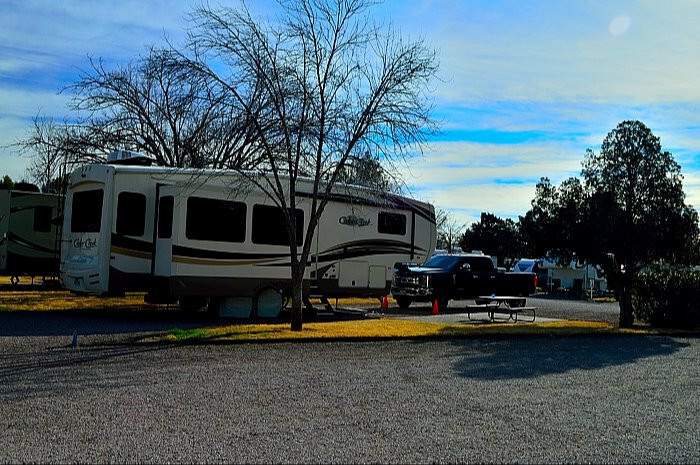 Ask fellow campers about "Sunny Acres RV Park (55+ park)" and nearby attractions. Long pull through spaces are in a row along one side of the park, fairly close spacing with no shade. Other than that, nice clean quiet park with friendly staff. We camped at Sunny Acres RV Park (55+ park) in a Motorhome. Easy entrance and parking to register at the office. Easy navigation of interior roadways. Lengthy pull thru site for my 60' combined length of RV and car hauler trailer. FHU services convenient at site. Cable TV is at each site. It is the older SD instead of HD but doesn't require a controller. Simply tune tour TV to the cable connection. Interior roadway is packed earth. Site are also packed earth with grass mediums between sites. Site are fairly close together but didn't bother me. Picnic table on grass mediums. We have stayed here before and return when in the area. We camped at Sunny Acres RV Park (55+ park) in a Motorhome. Valley Drive is under construction with orange cones and barricades reducing lanes to single lanes. Care needed when making turns into and out of park entrance. Access was good. Even with the construction on the street. Signage was adequate. Check in was quick, easy and informative. Parameter roads are gravel and in good condition. Our site, 32 was a gravelled back in. It was wide for an urban park. It came with a table, 30/50 power, water, sewer, cable and Wifi. Wifi was only fair. It did slow down on occasion. The park nlso has in addition to washrooms, a coin laundry, pickle ball court, and a fenced dog run. There are a number of permanents but we did not notice any sites that were trashy. This is an urban park so expect the normal sirens etc. The north end of the park appears to back onto a commercial lot. We noted some industrial noise while walking our dog but not much at our site. There are restaurants and groceries available within easy walking distance. All services are available in Las Cruces. We received a "construction discount" that was a little better than the GS that we expected. We paid $30.00 per night including tax and feel we received fair value for our dollar. We would return. We camped at Sunny Acres RV Park (55+ park) in a Motorhome. This is a very basic park however the staff is very friendly and helpful. 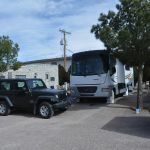 In fact, the staff gladly forwarded mail to our next RV park even though it arrived two days after we left. They even called us to keep us informed. The sites were large and the park was quiet and peaceful, even at night. We will definitely stay here again when in the area. 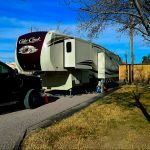 We camped at Sunny Acres RV Park (55+ park) in a Fifth Wheel. Rules are often responsible for killing joy but in this case they are responsible for a neat, barbered, peaceful and well-behaved neighborhood. This park has no junk trailers among the permanent residents (management keeps a tight rein on year of manufacture & appearance), cultivates beautiful oleanders/shrubs/trees around the space, holds dog owners to act responsibly and keeps the grass thick, watered and healthy. It was almost like the comfortable feeling of staying with your parents! On site # 70 utilities were conveniently located and reliable but water, electric and sewer hook-ups were bunched closely together requiring either some very short connections or a whole lot of creativity. Our heavily graveled pull-through was perfectly level without any correction. Wi-Fi was strong and easily connected; cable TV offered a wide selection of channels-some channels were sharper than others. Because of our short stay, most of the amenities were not used. Although clearly an older RV Park, I would describe the sense of this place as "exclusive." The one major criticism, which is temporary and beyond the control of management, is the horribly constrictive construction. We got a construction nuisance discount that was better than Good Sam. Be sure to call ahead and get specific instructions for navigating the mess. 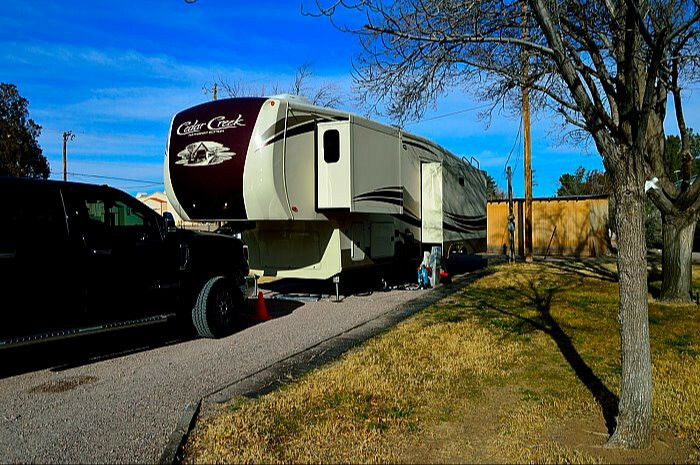 We camped at Sunny Acres RV Park (55+ park) in a Fifth Wheel. Take the time to visit La Masilla, its close by and charming. Another quick and painless excursion is a highway drive around the nearby Organ Mountains, the primary landscape feature of Las Cruces. Older park, but very nice lady checked us in. Just a stop over stay but close to whatever you might need. 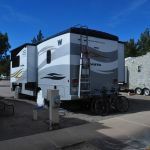 We camped at Sunny Acres RV Park (55+ park) in a Fifth Wheel. Road construction on city roads. Pay attention to lanes and barrels and you won't have an issue. Very nice friendly facility. We stay often and for several nights as we head south for the winter. This year the only "negative" was road construction at entrance of campground. Not an inconvenience, as we did receive a call warning us and instructions how to get to entrance. Otherwise experience was most positive. 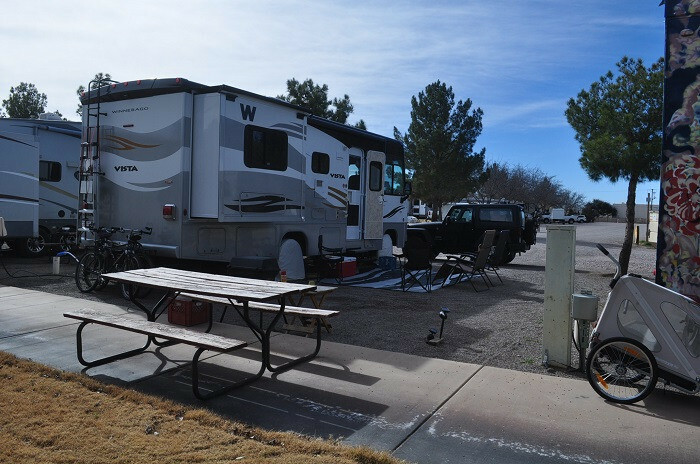 We camped at Sunny Acres RV Park (55+ park) in a Fifth Wheel. Other than congestion getting out of drive there was grocery close by. Other facilities ie: gas, dining were easy to access. My husband was thrilled to find a pickle ball court but unfortunately nobody here to play a game. ?Maybe next time We camped at Sunny Acres RV Park (55+ park) in a Motorhome. A well maintained park with good wifi. Restrooms & laundry room very clean. A good dog park and very friendly service on the office. But getting in and out of the park is very difficult with the road construction. 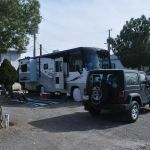 We camped at Sunny Acres RV Park (55+ park) in a Motorhome. Only right turn getting in and out of park. Just be careful and patient with traffic. Really liked this RV park. We had a rally there with 11 rigs. They reserved the club house for us. It is a great club house with a kitchen, games, pool table, projector for watching movies, tables and chairs, etc. They have a dog park. They have long pull through sites and the roads were easy to navigate with big rigs. Great location in Las Cruces. The front desk staff were very helpful. We camped at Sunny Acres RV Park (55+ park) in a Motorhome. Nice clean older park converted from a mobile home park. Gravel roads and parking sites. Treed sites appear to be dedicated to long term stays while transient sites are mostly the back row in full sun and are a little narrow considering the bush plantings between the sites. Wi-fi, free, worked well as did the free cable TV. Verizon signal is strong. No pool or spa area. Nice fenced dog run. Far enough away from major highways to be quiet at night except for minimal city noise. Water connection was near the back of the site so a reach of about 25 feet was needed. We camped at Sunny Acres RV Park (55+ park) in a Motorhome. Old Masilla is interesting to explore. La Posta is a noted Mexican restaurant in Old Masilla although my last experience there was a bit of a letdown for food quality and cleanliness of utensils. White Sands, park and missle range, is an easy day trip. Check in was easy, with a nice person. Laundry, which we needed after a week at state parks, was reasonably priced and clean. The park is away from loud roads, so is relatively quiet. 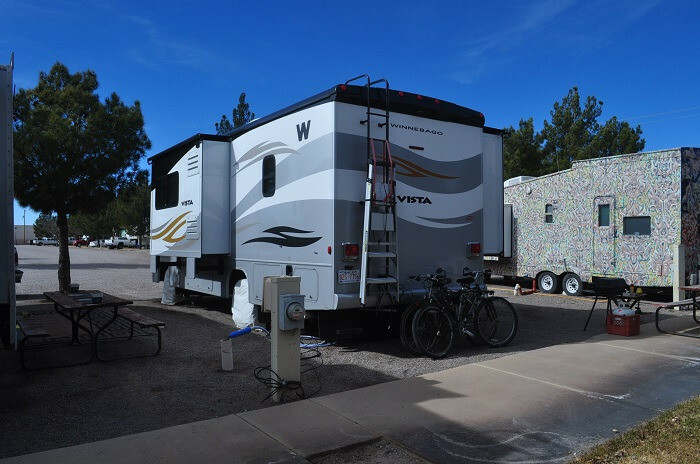 However, as we seem to be finding too often when we stay at RV parks, there were many much nicer sites available than the one assigned to us. Our site backed up to a dilapidated fence, had mostly dead grass, and long term residents on both sides. In the middle of the park there were several vacant spots with healthy grass, trees, and what looked like short termers like us. What the heck! We made a reservation several days ahead. Why wouldn't they have given us a more desirable site? 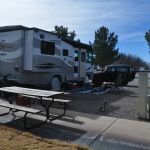 After staying in Arizona and New Mexico State parks on this trip, where we were able to select our sites from those available when we reserved and paid between $14 and $30 for large, wide and clean hookup sites, is it any wonder we continue to really dislike staying at RV parks? We camped at Sunny Acres RV Park (55+ park) in a Travel Trailer. We had a pull thru site in back section. We were meeting up with friends who were already at the park for the previous 3 days. There was a pull thru right across from them that our friend had requested for us but was told we couldn't have it.Then when we arrived we were told it was reserved. Late that night the site was occupied and the RV was gone very early the next day. We just didn't understand why we could not have the site near our friends. There was a bit of train noise not bothersome to us. Others complained of dumpster/industrial noise but on a Saturday morning all was quiet. 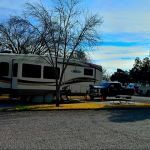 We camped at Sunny Acres RV Park (55+ park) in a Motorhome. Go to Old Town Las Cruces for feeling of the past. Well laid out and managed park, has some but not too many "permanents", close to downtown with all shopping, restaurants etc. Had a good impression of park, however does not have many pull through sites and those that there are, are very close together! Although rate is a bit higher than we like, value wasn't too bad, would stay here again if in the area. We camped at Sunny Acres RV Park (55+ park) in a Motorhome. It's a nice small little park. We are parked on a level gravel corner lot with a nice size cement patio and some grass and a tree next to us. The bathrooms are clean, but a bit tired as are the community and laundry rooms. 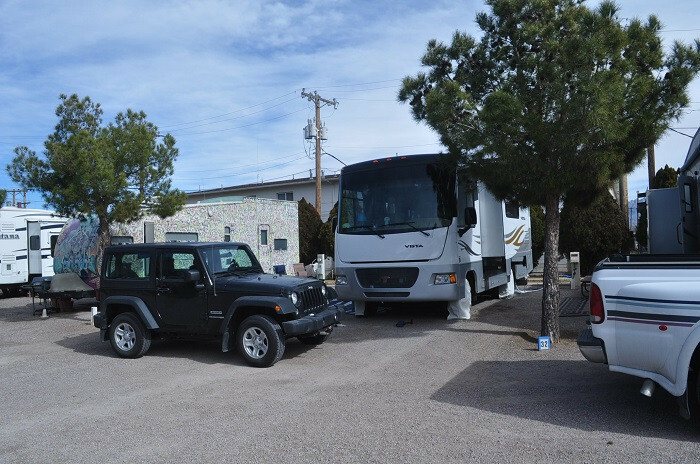 The gravel RV lots are groomed every time a guest leaves and the interior roadways, which are easy to navigate, are groomed regularly. WiFi worked great till about 4 pm and then it slowed down. We had a good selection of cable channels, Verizon worked great. Hookups were easy. No traffic noise, it's a very quiet park. We camped at Sunny Acres RV Park (55+ park) in a Motorhome. We went on a "hunt" to find the water tank murals. A local artist, Anthony Pennock, has painted some of the city water tanks and they are beautiful. Information and directions about the murals is at: https://www.newmexicoexplorer.com/water-tank-murals-in-las-cruces/ The mural that represents space exploration is off of Nasa Rd on the I70. There's a small museum near it. White Sands National Monument is an easy drive from here. Got to El Jacalito at 2215 Missouri Ave for good burgers and mexican food, see Yelp review. Las Cruces is a nice town with culture museum, art museum, science museum, etc worth visit. On Saturday and Wednesday there is a farmer and craft market in town square to go to. A must visit are some of the 12 wineries...had excellent wine (and fire oven pizza) at Luna Rosa Winery. Two locations of winery, this location had Italian food and gelato! You are within driving distance of White Sands Missile Range and three casinos near Mescalro Apache Reservation. Had pizza delivered. WalMart about 1 1/2 away. Make sure you check out the Dripping Springs Natural Area. The 1 mile round trip hike to La Cueva and the Hermit's Cave is an easy walk and spectacular. Within one block of a grocery store, Wal Mart about a mile away but convenient to most any kind of shopping need. White Sands National Monument an easy drive as well as White Sands missle range. The mountains just east of town are now the Organ Mountains - Desert Peaks National Monument. There is a small park service office with some trail maps and ready advice for nice day hikes into these mountains. As others have noted, Mesilla Old Town and La Posta Mexican restaurant are good choices. Exploring La Mesilla is a fun way to spend a day, especially if dinner at La Posta is included. And Las Cruces makes a great base for day trips to White Sands National Monument, Alamogordo's Museum of Space History, the Inn at Cloudcroft, Silver City and the Gila Cliff Dwellings, and Hatch. In Texas, there are the nearby Franklin Mountains State Park's Aerial Tramway and War Eagles Museum, plus Big Bend and Guadalupe Mountains National Parks are just a few hours away. Visit old Mesilla. We went to La Posta and thought it was great, although the food was just average, still worth the trip. It's in a very historic area and there was so much to look at. Prices on food were good but drinks were pricey. Be sure to have a meal or two at Nellie's Cafe, just around the corner from the entrance to the park on Hadley. Can you say delicious New Mexican cuisine!?!?!? A Walmart Supercenter off I-10 Exit 140. This is a great place to stay to Visit White Sands National Monument. VZW cell service was great at 4-5 bars LTE. Las Cruces is a college town so there are the usual amenities: fast food, local/chain restaurants, shopping centers, national grocery stores, shopping centers, etc. State and federal parks are in the area. We visited the Heritage Farm during our stay. Area is known for pecan, pistachio and vineyards ... we did not have time to tour, but will next time in the area. Close to historic Ole Messila. Don't stay in the last aisle (the AA, BB, CC, etc.) aisle because that puts you right next to the commercial operation and the noise. It might seem good during the day to be at the back of the lot, but on weekdays, they start early -- I would estimate the noise began around 4-5 a.m. Weekends might be o.k. as they're likely closed then. Big rig friendly. We have a 42 foot 5er with 5 slides. Plenty of room. Don't miss dinner at Nopalitos on Mesquite, and excellent shopping in nearby La Mesillia. There's a lot of restaurants and shopping, including a Super Walmart. We always make it a point to go to the local frozen custard/hot dog stand. The sundaes are out of this world! If you are there before dark, you can see the mountains by looking across the street - beautiful! The sunsets are magnificent. If you want to go out for dinner, there's a good brew pub, High Desert Brewery, that's about half mile away. The food is very good, the people are friendly, and the drinks are excellent. My husband had the beer and I had a root beer which they make on the premises. Chala's Wood Fire Grill in old Mesilla is delicious with a modern twist on traditional Mexican cooking. If you are looking for inexpensive, Pepe's has a great deal of fifty cent tacos on Tuesday! Less than five minute walk from RV park. This RV park is in a fairly flat part of town where bike rides to the rec center, library, and grocery store are short, but on busy streets. The university and Old Mesilla are a bit far for us to ride bikes, but are just a short drive away. Being in NM's second largest city is not like being in Arizona's second largest city! 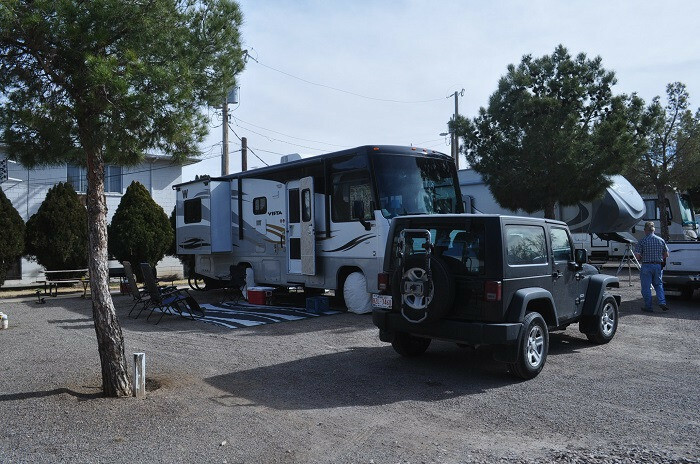 Las Cruces is small and everything an RVer might need is easily accessible. It was pretty cold when we were there but the downtown farmers market and historic Messilla are definitely worth visiting. Farmers market is open year around but just certain days so check with the nice people in the office for more information. Typical city park with city noises. They have security camera's so you feel safe. Entry is plain but park looks nice once inside. Super breakfast at "The Shed", just down the street on Valley. Plus, "Caliches" for frozen custard. Within walking distance (1/4 mile) there is a brew house. High Desert Brewing. They have some great beers and good pub food. All very cheap. Are you affiliated with Sunny Acres RV Park (55+ park) ?